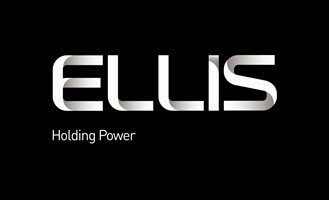 Ellis Patents Emperor and Vulcan stainless steel triplex cable cleats have been developed for the cable cleating of utility network high voltage (11kV) triplex cables. 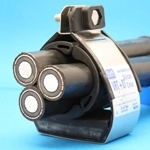 The triplex cable surround can be incorporated within a single cable cleat to secure three single core cables which are spirally twisted together (triplex cable). The triplex cable cleat surround is manufactured from LSF zero halogen polymeric material. Emperor and Vulcan triplex cable cleats suit 95sqmm, 185sqmm and 300sqmm 11kV single core cables (BS7870). The surround overcomes the twist in the cable to allow triplex cable cleating at any point along the length. Note - Triplex cables always have 3 cores but are often indicated as single cables on utility plans and network diagrams. Pictured : 11kV Triplex Cable - Solid or stranded aluminium conductor, XLPE insulated, copper wire screen (35sqmm). MDPE outer sheath. Red. 11kV to BS7870.